I have been putting off starting my non-perishable food pantry for a while now, too long honestly. There always seamed to be some emergency that would come up at the last minute, but this weekend the day came that I carved a little money out of the budget and focused on gathering some food that required no refrigeration, and minimal prep time in most cases. Keep in mind, I already have three days supply of Mountain House food for my family in sealed buckets, which are thirty year shelf stable. That said, with the cost involved in them, I wondered how a walk down the grocery aisle stacked up price/calorie wise. It is well worth pointing out most of the items on this list are NOT going to last more than a couple of years in good conditions, and will require a regular regimen of rotation to keep from spoiling. Storage: Others may opt for mylar bags, but I chose food grade buckets and oxygen absorber packs. Note: The below is based on my local prices, yours may be slightly different. Overall trends should be reasonably similar though. 1. Rice - If I even have to point this out to you, you really need to step up your prepping game. Rice has long been a staple food for many nations and cultures, being robust and easy to grow while packing in the calories. It topped out our list for frugal prepper food at 2325 calories per dollar. In appropriately sealed containers, kept dry, this should have a fairly substantial shelf life. 2. Peanut Butter - Also high up the list, surprisingly beating our number 3 item, is peanut butter. 1637 calories per dollar, able to sit on a shelf without refrigeration for at least a year (I can't say longer, as I haven't stored it much longer than a year), and packed with nutrients, this is another obvious choice. 3. Black Beans - Black beans were cheaper than red beans when I went, so that's what I got. Adjust your shopping to your tastes and preference. 1581 calories per dollar, a natural pairing with rice, not difficult to cook and very filling in the absence of a meat option. 4. 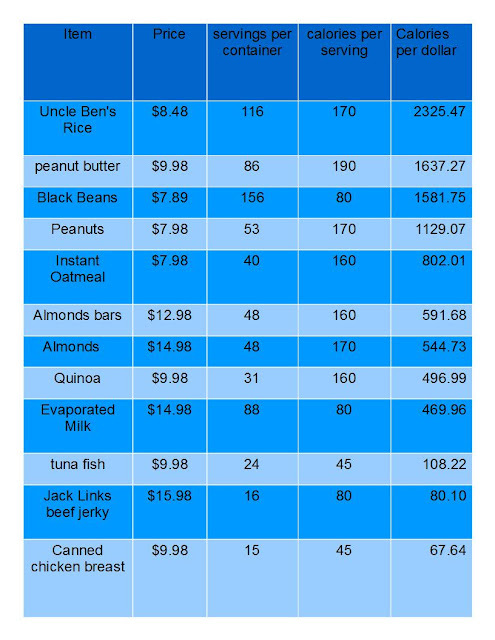 Peanuts - See peanut butter, 1129 calories per dollar. Also have the benefit of being portable, easier to eat than peanut butter, and kept dry last longer. 5. Instant Oatmeal - Being a dried grain, and something I'm likely to get my five year old to eat without bloodshed, this went in the basket as a low prep breakfast option. At 802 calories per dollar, it's also a good option for frugality and energy. 6. Nature's Valley Almond Bars - I wanted, and will add to this later, some sort of energy bar that was quick and easy to consume, no prep, individually packaged, no chocolate or other nonsense to make a mess when it gets hot. 591 calories per dollar wasn't too shabby either as we get into the pre-packaged stuff. 7. Almonds - 544 calories per dollar. Little different flavor for when the peanuts get old, not devoid of nutrition but more expensive than peanuts. 8. Quinoa - Key No What??? My wife added this to the shopping list, some sort of grain rice substitute native to Hawaii. Very nutritious, grains are much smaller than rice so it stores better taking up less space and weight, more expensive. 496 calories per dollar but not a bad choice. 9. Evaporated Milk - 469 calories per dollar, I don't have a cow hitched up behind the house so this'll be what I lean on to keep the calcium flowing when refrigeration runs out. 10. Tuna Fish - Good for nutrients that you won't find as plentiful in grains, but only 108 calories per dollar. In a pinch, I'd get a rod and real and try my luck at catching something. 11. Jack Links Beef Jerky - After a conversation with my wife today, we're looking into a dehydrator to start making our own beef jerky and dried fruit. In the mean time, this will provide a good source of portable, no prep, easy to consume protein. The calorie per dollar figure is a paltry 80, which could be partially mitigated by making it ourselves. 12. Canned chicken breast - Bringing up the rear with 67 calories per dollar, this is another solid protein option for when tuna fish gets old, but not as efficient per dollar as grains. Mountain House Essentials Buckets - based on the math I just did, my Mountain House brand meals come in right at 92 calories per dollar, being more costly per calorie than nearly my entire list. Their only benefit is portability, and shelf life. If money isn't your concern, and you want the easy option, Mountain House or a similar freeze dried survival/camping food is something I would consider.